"Among the black kids back in the neighborhood, the fifties in D.C. was an age of hot curlers, outrageous conks, and do rags. The crowd was greasing up and straightening out their hair. It was a time when Little Lord Fauntleroy Bandy ruled the airwaves at WUST..."
In the fifties radio was about showman ship ans shtick. The Lord Fauntleroy shtick was genius. On 1120 WUST-AM, a 250 watt daytimer he needed it. He hammed it up and wore tailored suits with a waist coat and an ascot. He brought hours of the hippest R&B to DC airwaves. As the Lord Fauntleroy Bandy, he spoke in a fake British accent on air. The accent was perfect, so perfect many people thought that he was white. But even off air Bandy didn't sound like he was from the Mid-Atlantic, he and his family were from Jamaica. Jet Magazine relished linking the dapper John Bandy to various singers and starlets. In 1954 it was Beauty Shop owner Meta Cardoza, before that TV singer June Gaskins. More here. 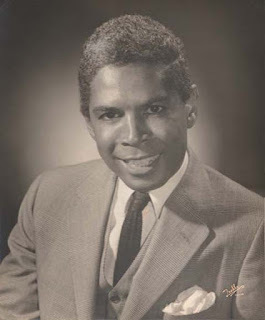 In 1960 Bob Klein hired Bandy at WDAS-FM in Philadelphia, where he became the assistant general manager. Multiple sources describe Bandy as adlib "rapping" over records at WDAS, which would be one of the earliest references to rapping in a hip-hop context. One of those sources was his fellow WDAS DJ and rapper, Jocko Henderson. "The Lord of Rhyme bringin' the sound from out of the ground to your part of town!" By 1963, Bandy was appointed a WDAS corporate vice president by station CEO Max M. Leon. 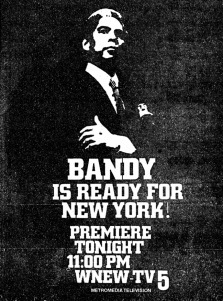 Bandy later had a short-lived stint hosting TV talk show on Channel 5, WNEW-TV. It debuted in February of 1971 and lasted eight episodes. He didn't really need the job, he'd married Gulf Oil heiress Roberta Pew in 1976. The book Voice Over by William Barlow claims he retired to a country estate in Bryn Mawr, outside Philadelphia. In retirement they funded a number of civic projects and organizations. Bandy died in the late 1990s. I have often wondered if he or Sir Walter Raleigh (John Christian) on WAMO in Pittsburgh (and later WEEP) picked up the faux-British shtick first. Christian, who started out at WILY-AM, also liberally applied a British accent, and wore a English butler suit with tails and a monocle. Christian first hit the air in about 1955 so they were active more or less concurrently. But I suspect either may have gotten it from Lord Buckley in one way or another. Buckley was actually British, but his lordship too was self-enobled. Buckley claims he got his shtick from another DC area hipster... Cab Calloway.